Newt Scamander (Eddie Redmayne) is a Magizoologist at the U.K.’s Ministry of Magic, who comes to America in 1926 in the hope of returning an incredibly rare Thunderbird he’s rescued to its native skies in Arizona. But on his first day in New York City, several of the magical creatures he keeps in his suitcase escape to cause havoc, a clear violation of local magical law. When he’s taken in for questioning to the headquarters of the Magical Congress of the United States of America (MACUSA) by a former Auror, Tina Goldstein (Katherine Waterston), Newt realizes that he’s inadvertently switched suitcases with a blue-collar cannery worker named Jacob Kowalski (Dan Fogler). Jacob dreams of opening a pastry shop but, when he’s bitten by one of Newt’s creatures, finds himself drawn into a world of wonders that he never imagined and soon attracts the affection of Tina’s sister, Queenie (Alison Sudol). Together, the four of them set out to recover Newt’s lost creatures and quickly discover an even darker mystery in the mean streets of NYC. Fantastic Beasts is a good film, but it’s a bit of a slow starter. This is a somewhat more adult version of Harry Potter, which is a nice change, and entirely appropriate given that the young audience who grew up with the franchise is now in their 20s and 30s. The film is well directed and the script – credited to J.K. Rowling herself – is deftly written; there are moments in this film that made me laugh out loud. I also think the quartet of lead characters is well cast. It takes a while to warm up to Redmayne’s Newt, as it should be – he’s a bit of a shy wizard. But once you see inside his bag, so to speak, he’s quite likable. (Potter fans will know him as the future author of the definitive Hogwarts textbook “Fantastic Beasts and Where to Find Them” read by Harry, Hermione, and Ron many years later.) Both of the Goldstein sisters, as played by Waterston and Sudol, are quite charming each in their way. And Fogler shines as the likeable American everyman “No-Maj” (the American equivalent of a Muggle). Really, my one issue with the film is this: The Wizarding World in America is… well, it’s not a very inviting or whimsical place, at least as it’s depicted here. In fact, it seems rather cold and ugly. Who wouldn’t love to visit Hogwarts, the Burrow, Diagon Alley, or Hogsmeade? But who in their right mind would wish to visit MACUSA, with its depressing death penalty chamber? Yeesh! Sonically, the 4K disc includes object-based English Dolby Atmos audio (compatible with multichannel Dolby TrueHD systems), as well as English 5.1 DTS-HD Master Audio, English Descriptive Audio, and French, Latin Spanish, and Portuguese 5.1 Dolby Digital mixes (optional subtitles are available in those languages and several more). The Atmos presentation virtually reference-quality, offering a highly-immersive surround sound experience with subtle and explosive activity coming from seemingly every direction. The interior space of Newt’s suitcase comes alive in the height channels, as does the end battle, and the panning is wonderfully smooth. Dialogue, music, and effects are all clear, clean, and natural sounding, while LFE support is strong and effortless, giving the spectacle extra punch and weight. What you get here is decent, but other than Before Harry Potter (and a couple of the deleted scenes) there’s nothing terribly compelling here. That’s not to say it’s bad in any way, it’s just nothing you haven’t seen before. Unfortunately, there’s no Blu-ray 3D disc included here, which is disappointing. However, the 3D version is available separately. You do at least get a Digital HD code on a paper insert. There are apparently four sequels to this film in the works, all of them prequels to the original Harry Potter, so one assumes we’ll see more of the Wizarding World in America in the years to come. I just hope it becomes a warmer and more welcoming place. 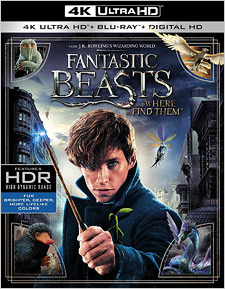 In any case, Fantastic Beasts and Where to Find Them is a good start to this new series, with plenty of its own charms, and it’s well worth watching on 4K Ultra HD.